'What? The alpinia has grown so much?! The thorn fencing near the picket gate needs repair. The dustbins are not cleared. Thank god, the precious Red Silk Cotton is reviving. Five new leaves....yay! Who's been burning stuff? Surely not the gardeners getting rid of the weeds this way? When will the composting unit come up? So many egrets! Ah, the Garganeys taking off and landing ... what a sight and so many of them .... Wait ... who are these two visitors? Never ever seen them at the lake or ... elsewhere! Definitely a stork. Which one? Blast, didn't bring my camera.' I call Nupur and catch her before she leaves home and request her to bring her camera. 'These birds ... need to id them.' I call birder Deepa Mohan and describe them. Larger than the egret, perhaps as big as our Purple Heron. Greyish white with black wings and pink legs. The bigger one has a gap between the beak. Deepa says she'll check her books and call back. I spot OPR waiting and with occasional backward glances at the new birds I walk faster. 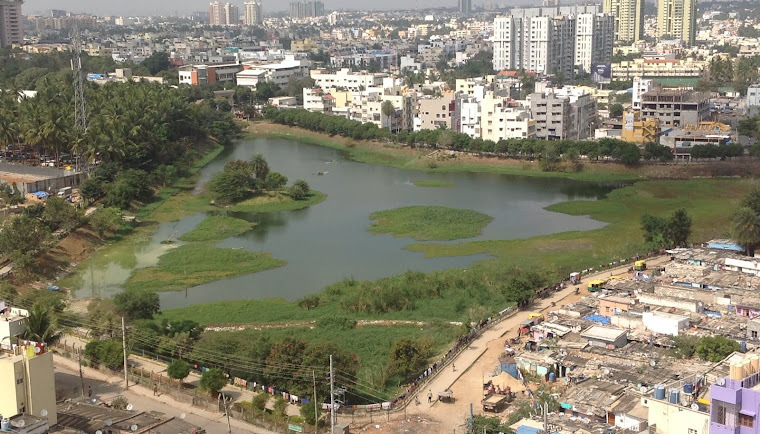 He says birder Srinivas has sent an sms "I just passed by the lake. There's an Asian Openbill Stork there. 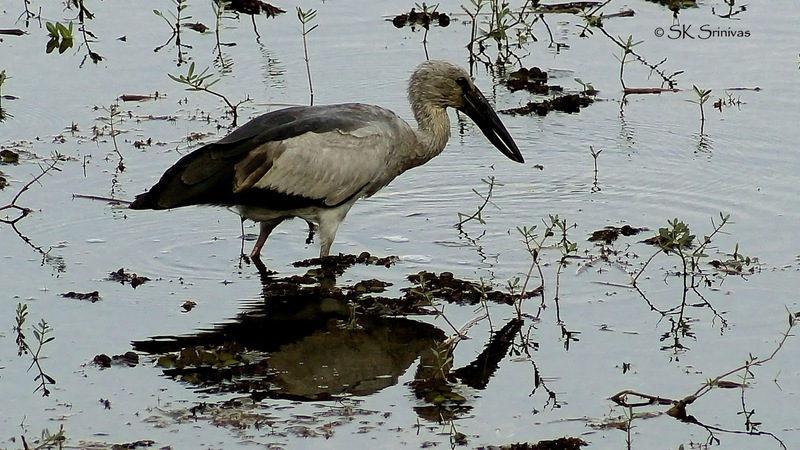 First time I've seen an Openbill Stork there." Yes! Yes! and Yes!! My heart is singing and I force myself to pay attention to the updates from OPR and Nupur. Yellappa, the fisherman is coming to discuss the periodic cleaning of the lake, outstanding success of Sapana's story telling session, a tanker of water (to water the plants) to be delivered tomorrow, plans to raise funds to maintain lake, etc...etc...etc...I recall the email updates from Arathi, Prasanna, Sapana, Sangita Agrawal .... Wow! 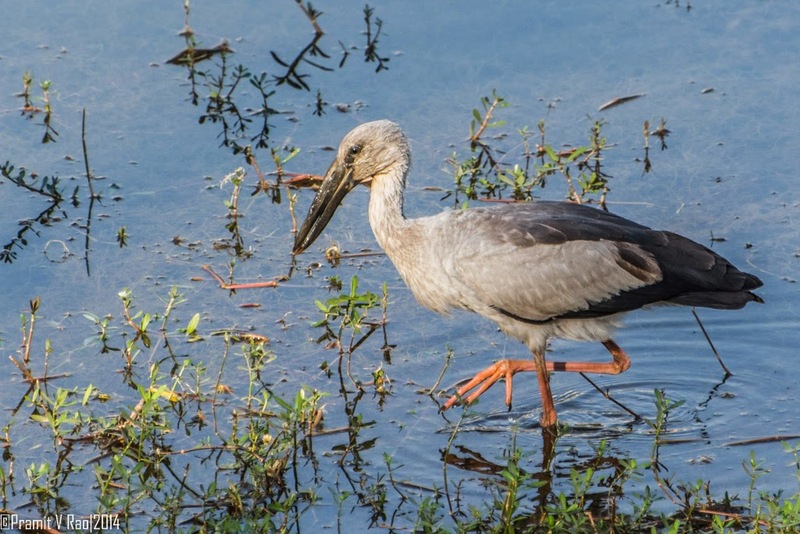 Before I can slip in a word, we see birder Srinivas enter with his camera and a wide smile. Seems he saw the Asian Openbill Stork while passing by the lake in a bus. He got off at the next stop, took another bus, rushed home, grabbed his camera and zipped to the lake to take pix of the Asian Openbill Storks! Two minutes later, Deepa Mohan comes rushing. She's identified the bird from my description and wants to see them for herself. They tell us that these storks are not often seen in an urban setting. Later I learn from wikipedia that these storks forage in wetlands. Their beaks facilitate the breaking open of the hard shell of snails. The renewed excitement of the new species at our lake takes over from the nitty-gritty details of maintaining the lake and other chores. I return home with my heart singing again this time as much in praise of my friends at PNLIT as for the birds new and old flocking to our lake. 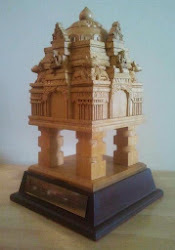 See more pics taken by Srinivas here, and by Nupur here. See Deepa's video of the birds on Youtube here. and her blog post/pics here. Today morning I was told that the newcomers were still chomping at the snails and the fish. If you are as lucky as we were, you'll see them at the lake too!